The A48 is a major trunk road in Great Britain. It runs from the A40 at Highnam 3 miles (4.8 km) west of Gloucester to the A40 at Carmarthen. Before the construction of the first Severn Bridge in 1966 it was the principal route between South Wales and South West England. 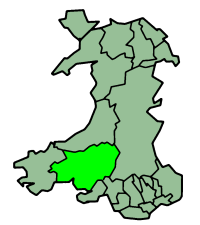 For most of its journey through South Wales, it runs almost parallel to its successor. 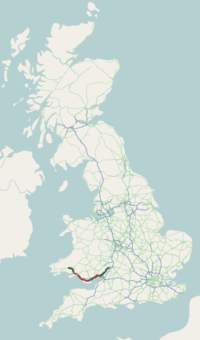 Before the construction of the Second Severn Crossing, during times of high winds at the Severn Bridge the A48 was used as part of the diversion route, and is still marked as a Holiday Route. 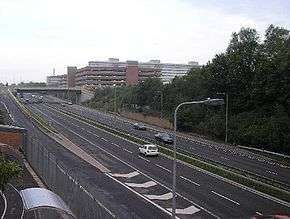 There is a motorway section (the A48(M)) which is a spur from the M4 running from junction 29 on the west side of Newport. The A48(M) has the unusual feature of having no junction options at both ends – it leads into limited-access junctions. Near the east of Cardiff, at St Mellons, it ends by flowing onto the A48 (Eastern Avenue) and through Cardiff. It is 2 miles (3.2 km) long and is a 2-lane motorway throughout its length. At St Mellons it runs continuously into a further 6 miles (9.7 km) of the dual-carriageway A48, which also features (albeit narrow) hard shoulders. The original A48 continues to link Newport and Cardiff. The A48 from Highnam to Newport runs adjacent to the River Severn. It runs through a series of villages, until it reaches Chepstow where it crosses the Wales-England border. From the M4 Motorway at J15 near Swindon, traffic is directed for Wales if it is over the Severn Bridge weight limit of 44 tonnes. Traffic is directed onto the A419, then onto the A417 after Cirencester, and at Gloucester, onto the A40. This road has some speed cameras, as there have previously been incidents here, and have been erected to prevent them happening again. During busy periods, such as the Severn Bore, this road may become busy with parked cars near the river's edge. The road is generally quite empty and free running, with no heavy traffic reports. The road also runs next to the Forest of Dean. The woods may be viewed from the roadside, as may the hills of the Dean. There is a level crossing in Lydney. Until Chepstow, there is a height limit under the low railway bridges. Tall vehicles are directed to Newport on the A40. For some parts of this route, short distance dual carriageways occur, especially on steep hills. ↑ Jeni (September 2006). "Abandoned A48 1". The abandoned A48 carriageway at Neath. Society for All British Road Enthusiasts (SABRE). Retrieved 2009-11-16. ↑ Dr Joanne Hill (July 2008). "Getting ahead" (PDF). Road Safety Foundation. p. 13. Retrieved 21 September 2013.